Dr. Aliya Aftab completed her BA in Psychology from Kinnaird College before pursuing an MSc. in Psychology from Government College Lahore. She completed her PhD in Clinical Hypnotherapy from the National Guild of Hypnosis in California, USA. Before completion of her PhD, Dr. Aftab studied clinical hypnotherapy at the Hypnotherapy training institute at Corte Madera, California. Upon completion of her studies there she returned to Pakistan and along with her sister Mariam Aftab set up a counseling center called “Stress Management Institute”. They offer extensive counseling services related to different areas such as stress, anxiety and depression. As a clinical hypnotherapist she also conducts workshops on self-hypnosis, stress management, color therapy, Neuro-Linguistic Programming and Reiki healing. Having the rare combination of being a Reiki master as well as a doctor of hypnotherapy Dr. Aftab inculcates healing methods from both fields in order to provide a unique system of healing. Her healing techniques are a fusion of eastern and western medical practices. Most of her patients come to her for Stress Management problems and she treats a great number of clients suffering from problems of low self-esteem. The advantage of working with hypnosis over other psychological methods is that Dr. Aftab is able to probe deep down into the subconscious mind of the patient and diagnose the fundamental root of the problem, making the eventual treatment more effective. 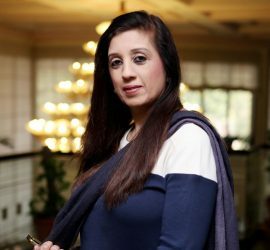 She has given several live-hypnosis demonstrations at prestigious institutions such as Kinnaird College and Home Economics College Lahore as well as at organizations including The Rotary Club, Lahore Metropolitan and Women’s Voluntary Service, the humanitarian arm of Fatima Memorial Hospital. Dr. Aftab also has to her credit a book that focuses on healing methodologies called Self-Healing Techniques for Stress, Anxiety and Depression. Further, she has a bi-weekly column in “The Daily Nation”, and her articles have been featured in Dawn and She Magazine. To further awareness on issues of mental health, her Stress Management Institute publishes a quarterly magazine named Qismat, with an interactive twist where they invite questions from their readers and focus on solving their problems through this medium. She has also been conducting workshops for Civil Aviation Authority, Global Telecom, Tetra Pack, Kainnaird College Lahore, Punjab University Lahore Grammar School, Lums and Fast University Lahore. Workshops were conducted on Crisis Management, Stress Management Personality Development and Interpersonal Communication. Seminars were also conducted on anger management and personality development for sacred heart school. Recently she went to India to get raining in Su Jok Therapy ( Accupressure), Astrology and Numerology.